I am writing today’s post in response to a blog writing prompt on www.geneabloggers.com, which is a great website devoted to providing ALL types of blogs about genealogy. They suggest for a slow, lazy Sunday, to write about those black sheep of the family. Now don’t get me wrong. I love black sheep. What I love about my own family is that everyone seems to be a black sheep. None of us are like each other at ALL and if we were in a normal family, we’d all be the total weirdos, cast off, like day old bagels. But Andrew has got some nasty ones in his family. Sometimes I just have to remind him, when I feel like maybe he’s forgotten, that he has murderers in his family and it runs in his blood. He usually just rolls his eyes. But I know deep down that he’s taking it to heart. Andrew and I got married last year, after a lengthy courtship of like…7 years. By the time we got to planning our honeymoon we were mostly thinking about a sensible trip. Something that will be warm in December, but close enough that we won’t waste a ton of time traveling, and cheap enough that we won’t have to put anything on a credit card. Well, two out of three ain’t bad. We ended up in Saint Augustine, Florida, which we loved. It was in this country so travel was relatively easy. It wasn’t super expensive. It was, however, freezing. So all those nights we had planned to have drinks out on the deck of some precious tucked away bar fizzled when we got there. So we spent a lot of nights in. One night I got on the laptop (yes, we brought the computer on our honeymoon) and we were just sort of watching a House Hunters International marathon (so romantic, I know); and I was just messing about on Andrew’s tree as he was in and out of sleep. I was doing the census record searches for a cousin of his, Milo Long, and it looked like he was in prison in Montana. I was very confused about this and looked at the records and noticed a Walter Long as well. Turns out they were brothers. And they were actually in jail in Montana. I just kept wondering how these two farmville Indiana boys ended up in a Montana prison. After a short bit of research I came upon the answer! Both Milo and Walter went after the family of John Hayes after a “claim dispute” in Montana. According to the local paper, they had supposedly abandoned the claim, near Culbertson, Montana. When they found out someone had taken up residence in that spot they headed over there and gave this man a warning. The Long brothers, with up to 14 more ruffians, threatened the family and said they had 24 hours to get off the property. 24 hours later, they came back and the family was still there. The group proceeded to shoot up the property, killing John Hayes and his 11-year old daughter, Augusta. Milo and Walter were incarcerated at Old Montana Prison at Deer Lodge, which is now on the National Register of Historic Places. The prison housed its first inmate in 1871 and closed up shop in the late 1970s. There are all sorts of ghost stories attributed to the prison, but that’s nothing new for a prison, right? Looks like the next time Andrew and I are visiting Big Sky country we might have to make a stop to see where his cousin’s hung out for a short time. They have tours! 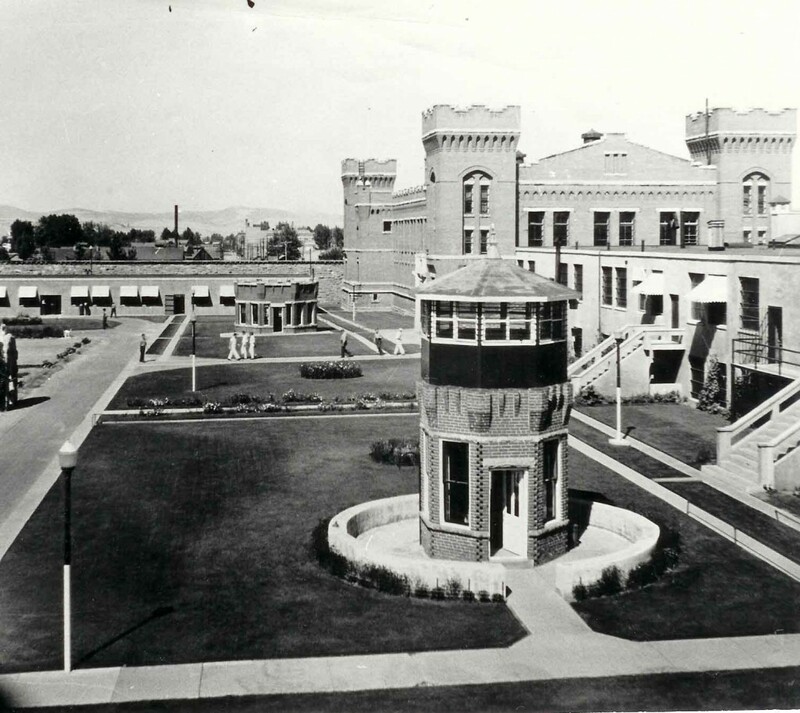 This is an older picture of the Old Montana Prison before it was shut down in the late 1970s. Now, once they got out, Walter got married and had three kids (one of them, a girl, named Delight – I swear). Milo got married a few times to a Helen, a Lola, and then a Nevada. True to life Black Sheep here. I wish I had pictures of these guys.